ItemBARK_1980.0112.0151 - Avaline Hoy and Henry Sing on their wedding day, with bridesmaids Laura Sing, Beatrice Keen, and Anne Hoy, in the living room of the Hoy's home; July 1937. Item BARK_1980.0112.0151 - Avaline Hoy and Henry Sing on their wedding day, with bridesmaids Laura Sing, Beatrice Keen, and Anne Hoy, in the living room of the Hoy's home; July 1937. 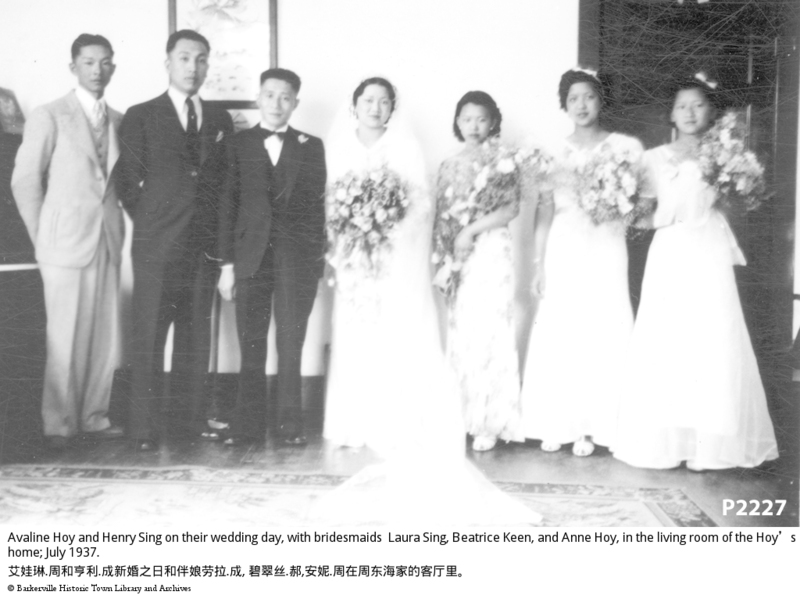 Wedding party of Henry Sing and Avaline Hoy. Left to right: Unidentified, unidentified, Henry Sing, Avaline Hoy, Laura Sing, Beatrice Keen, Anne Hoy. The four women are dressed in long white dresses and are holding flower bouquets. One of the men is wearing a light coloured three piece suit and the other two are wearing dark suits. THIS IMAGE DEPICTS A 4 WOMEN, 3 MEN WEDDING PARTY. HENRY & EVELYN SING (NEE HOY). THEY ARE ALL STANDING IN A LIVING ROOM TYPE AREA. THERE IS AN UPRIGHT PIANO TO ONE SIDE OF THE GROUP AND A CLOSED DOORWAY BEHIND TWO WOMEN IN THE GROUP. THERE IS A VERTICAL, FRAMED PIECE OF ART WORK BEHIND THE GROUP ON THE WALL.